Auction site eBay isn't really much of an auction site anymore. This month, a study from the National Bureau of Economic Research reveals that less than 15 percent of all eBay listings are auction-only. Today, the majority of sales are made with eBay's "Buy It Now" option -- that is, buying it for a listed price like one does on Amazon or any other e-commerce site. This is down from nearly 100 percent 10 years ago. Clearly, online shoppers have changed their habits and goals, and online auctions have fallen by the wayside. The four researchers from Stanford and eBay hypothesize that the time and effort it takes to win an auction encourages would-be buyers to directly buy goods instead. A decade ago, bidding on online auctions was a popular form of online entertainment. A lot has changed since 2003, and sites like Facebook and YouTube are taking up more of Internet users' time. People are now looking for convenience when it comes to online shopping, not games. In February 2008, eBay changed its search ranking algorithm. Rather than putting the soonest-to-end listing at the top — a natural strategy for auctions with a fixed ending time, but less natural for posted price listings — it implemented a relevance ranking. Then in September 2008, eBay allowed 30 day posted price listings to be "rolled over" with automatic payment of the monthly listing fee. One other potential factor that neither the study nor Businessweek touches on is that Internet users may be taking their possessions to Craigslist. Craigslist is popular since it's pretty much all user-run, so users can negotiate, barter, and even trade without any middle man. eBay sellers often use auctions for one-of-a-kind items or items they are eager to get off their hands, and it seems like those transactions may have moved to Craigslist in recent years. 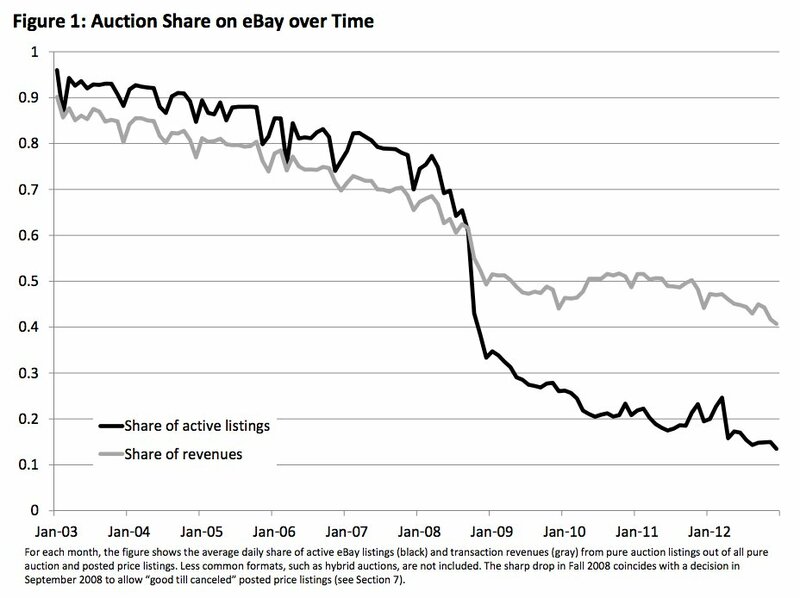 eBay certainly isn't struggling, despite its issues with auctions. While it hasn't had the precipitous growth that its close rival Amazon has in recent years, its stock has reached out its 2004 high since the recession. It reported $3.7 billion in revenue in the first quarter of 2013, up 14 percent. For one reason or another, Diana Duyser of south Florida held onto a grilled cheese sandwich resembling the Virgin Mary for over 10 years. But in 2004, Duyser got some bread for her bread, <a href="http://www.msnbc.msn.com/id/6511148/ns/us_news-weird_news/t/virgin-mary-grilled-cheese-sells/#.UGYFt_nuXDU">selling the holy cheese sandwich to online casino GoldenPalace.com for $28,000</a>.